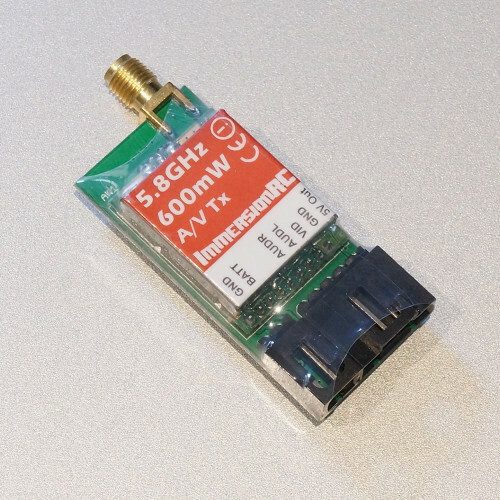 New Model: Measuring just 50x23x15mm, that's 40% smaller than its predecessor! The product will accept an input voltage of 3-6s and includes a sophisticated switching regulator to power itself and your 5V camera cleanly and efficiently. 5V camera power, ideal for a KX131/ SN555, is generated onboard. For use by licensed Radio Amateurs only in the UK. May also require a licence to operate in other countries. Please check before use. The use of this product may be prohibited in your country/region/state. Please verify that the RF output power and frequencies used by this transmitter comply with local rules in regulations, this product may require a HAM license to operate. In EU, max. output power of video transmitters for general unlicensed use is limited to 25mW on 5.8GHz and to 10mW at 2.4GHz frequency. Transmitters with bigger output power may be legally used if you have HAM license (you can ask about obtaining a license in your local radio club) or if you are using this product for research/scientific purposes in controlled environments.